The apparent molecular weight of laccase, previously estimated at 63 kDa by SDS-PAGE (Schliepake et al. 2000) was consistent in the laccase from days 3, D3 + 30 min, 4, and 20. The protein bands from samples on days 23 and 25 migrated further in the gel and gave a molecular weight of 54,620. 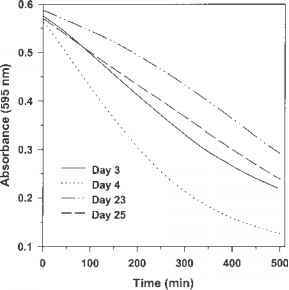 On electrophoresis of the purified reactor samples, under native conditions, and visualizing laccase active bands with guaiacol, significant variation occurred in the migration of the enzyme through the gel from different days. Electro-phoretic migration of proteins under nondissociating buffer conditions occurs on the basis of both size and charge (Hames 1990). This variation in migration indicated that physical transformation of the enzyme may have occurred during the reactor cycle without loss of the enzyme activity. Figure 4 Elution profile of laccases from day 4 (A) and day 23 (B). The 100 ml sample was concentrated to 5 ml, passed through Sephadex G 75 and active fragments pooled. The active solution was concentrated through Centricon ultrafilters and the concentrate passed through a Bioscale 5 anion exchange column, using the same gradient as for the Mono Q column but spread over 35 min and at a same flow rate of 1 ml/min. Purified laccases were subjected to IEF and stained for activity. The enzymic banding pattern showed significant variation on days 3, 4, 20, 23, and 25. The activity stain showed that on day 3, prior to the addition of the dye to the reactor, five bands stained for laccase activity, with the strongest staining bands towards the anode. On day 4, six bands were observed and the band closer to the cathode had the stronger stain. 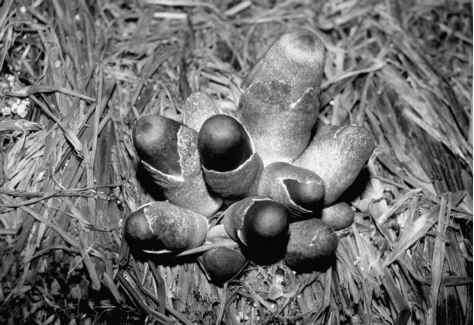 A similar pattern was also observed on day 20 of the reactor cycle. On day 23 and 25, however, there were only four bands and the band nearest the anode was again the strongest staining band. Such a pattern of laccase on IEF was considered artifacts due to the nature of the gel (Eggert et al. 1996). The variations, together with the migration on the native PAGE, however, did not exclude modification of the enzyme over the reactor cycle. Figure 5 Decolorization of dye RBBR by laccases from various days. 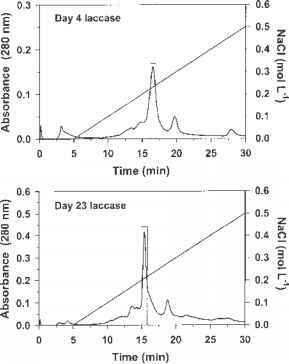 Laccase preparations (15 mg protein) from day 3,4, 23, and 25 were mixed with 1 ml of RBBR solution (50 mg/l) and the absorbance at 595 nm monitored for 7 h.